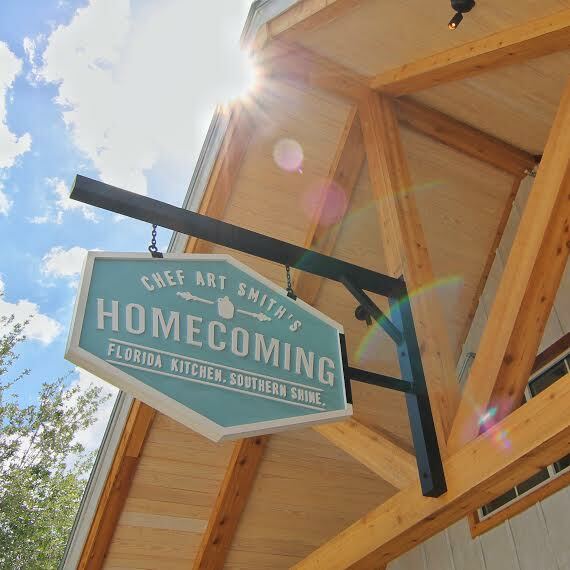 Probably one of the most eagerly-anticipated of all the new Disney Springs dining locations, Chef Art Smith’s Homecomin’: Florida Kitchen & Southern Shine sits in a prime location in the springs: just behind STK, across from Morimoto Asia, right across the springs from D-Luxe Burger. Open as of Tuesday, July 12 to all guests, the restaurant is taking walk-ups only for lunch and dinner (Sunday-Thursday 11:00 AM-midnight, Friday & Saturday 11:00 AM-1:00 AM); guests will be able to make reservations beginning July 15 for meals on or after August 15 through My Disney Experience. 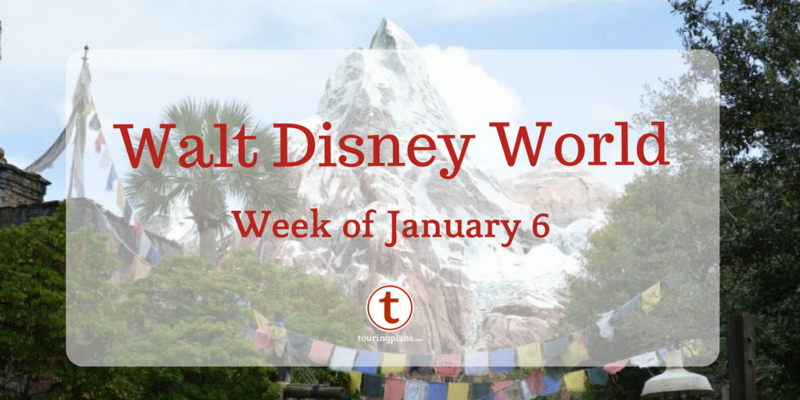 Sadly, no discounts are offered just yet, but the Disney Dining Plan is accepted. 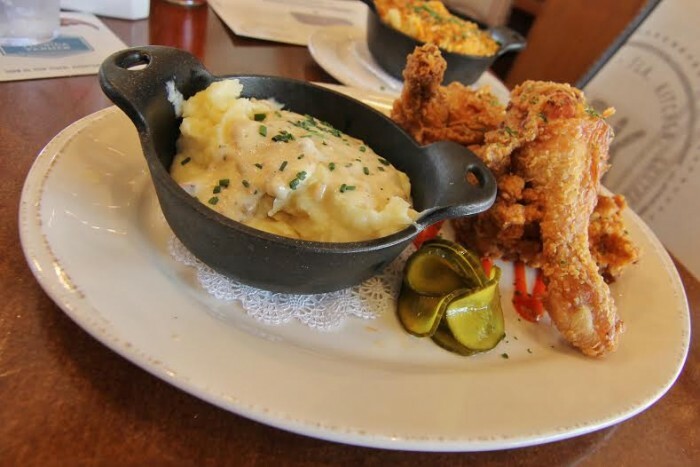 I was lucky enough to dine at Homecomin’ Kitchen on opening day to taste their take on upscale Southern comfort food. Farm-to-table Southern classics are are the focal point of the menu, highlighting the flavors of Chef Art Smith’s native Florida. 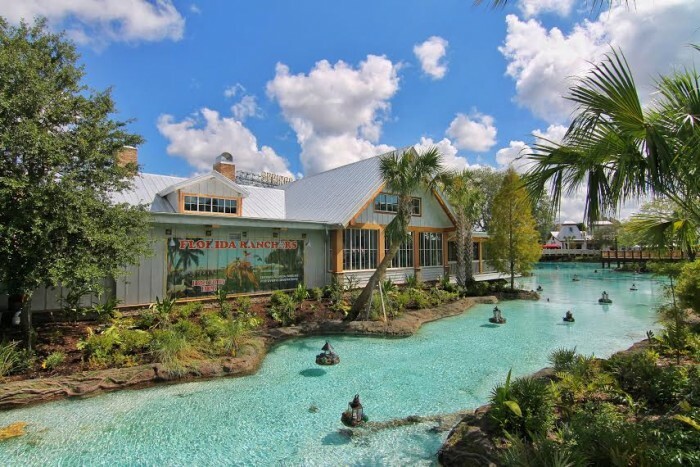 Even the décor in the restaurant is Florida-centric: 51% of everything inside was sourced locally, and the beautiful murals of Florida’s natural wonders on the interior and exterior were painted by a local Florida artist. Natural light floods the main dining room, with a large bar in the center, burlap-sack lighting fixtures accenting the custom-crafted wood tables and Homecomin’ Kitchen-logo-adorned chairs. A screened-in porch wraps around the back side of the restaurant, perfect for enjoying an outdoor meal right on the springs. The amount of home-state pride really shines through in every facet of the restaurant as soon as you first walk in, setting the expectation that this is probably going to be a great meal for Southern comfort food fans. The menu has a pretty wide spread of options, depending on your budget and hunger level: easy-to-share starters and desserts book-end reasonably-priced sandwiches/salads and more-filling main plates, along with a wide variety of shareable side dishes. Like we saw with Frontera Cocina’s all-day menu, I was happy to see that Homecomin’ Kitchen does a really great job including options appropriate for both lunch and dinner. My server, incredibly excited to greet and seat me in the bustling restaurant, recommended a few of her personal favorites right off the bat: the Palmetto Punch or Fig & Berries to drink, shrimp jubilee to start my meal, and shrimp & grits or any of the fried chicken dishes as my main dish. I also learned that many of the favorites from the main menu are available to-go – takeout menus featuring many of the restaurant’s favorites are available at the hostess stand and you simply place your order at the bar, or order from the shorter “grab and go” menu of sandwiches and sides from the outdoor bar – a great option for those on the go! 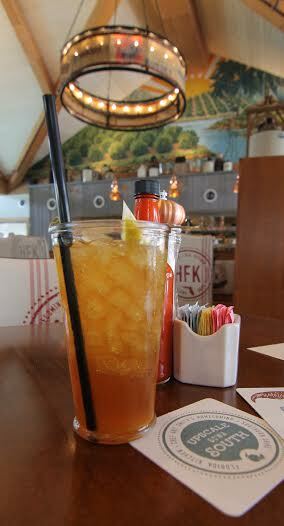 Any good Southern meal has to start with a refreshing glass of sweet tea, but given the “Southern Shine” part of Homecomin’ Kitchen’s name, I had to give the Sweet Tea Shine ($12) a shot – sweet tea with lemon juice amped up by a splash of moonshine. Southern sweet tea tends to be cloyingly sweet, but this was well-balanced – the kiss of lemon juice brought some tartness forward, serving to offset the moonshine bite. It’s not an overly boozy drink at first sip, even for those not accustomed to moonshine’s flavor (think: younger brother of whiskey), but it packs a punch. I only needed one of these to satisfy my sweet tooth, but the remainder of the bar menu definitely piqued my interest – a great variety of liquors in the hand-crafted cocktails (each made to order, unlike the margarita and sweet tea shine jetsprays made fresh daily), and tons of Florida brews available on both tap and bottled if beer is more your speed. To start off the meal, I sampled the Church Lady Deviled Eggs ($10), described on the menu as “Homecomin’-style whole deviled eggs”. 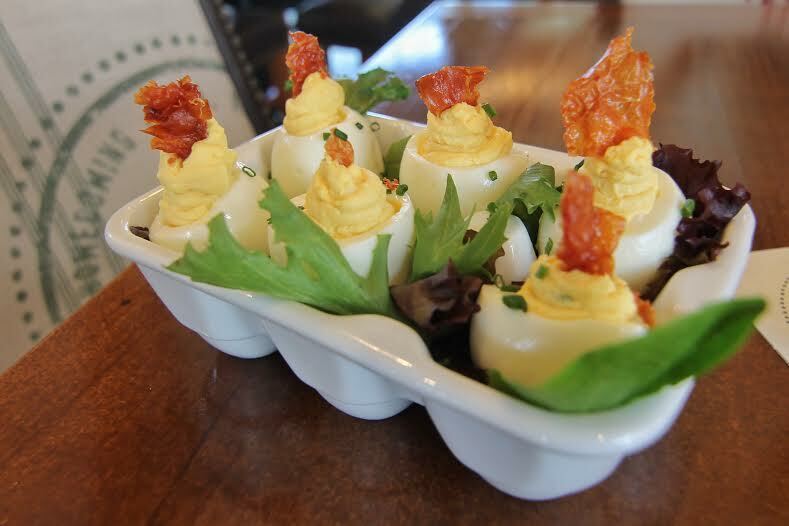 They come six to an order, which may sound small, but remember, that’s six whole eggs, so in traditional deviled egg terms, it’s a pretty healthy portion. Served on a bed of arugula in a nifty ceramic egg-carton dish, these eggs pack a slight punch of pepper on the front end, with a divinely creamy yolk filling dominant with chive flavor. Happily, they were free of that often-present sulfurous smell that can accompany deviled eggs. Crispy prosciutto on top of each egg offered textural contrast and a little extra savory note to each bite. Overall, I could’ve gladly eaten all of these in one sitting, and will definitely order them again on a future visit. 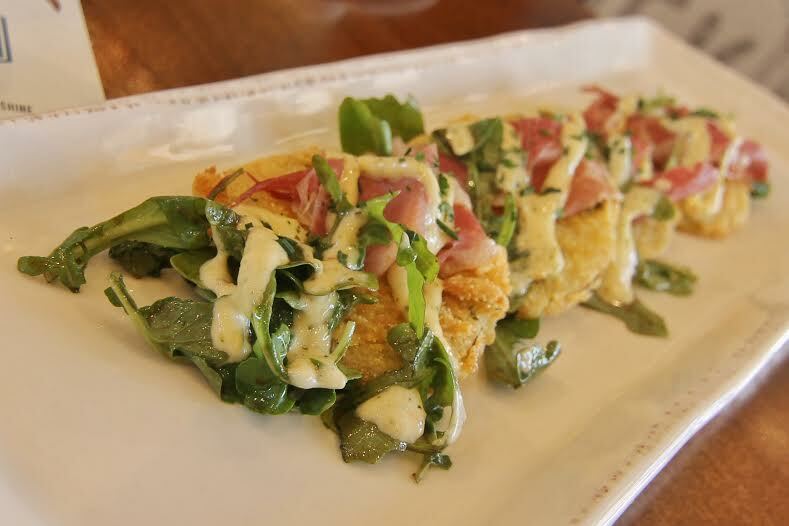 Up next are the Bee Haven Bay Fried Green Tomatoes ($12), fried in a crispy cornmeal coating, with four tomato slices topped with arugula, remoulade sauce, and shaved ham. This dish is basically a perfect snapshot of Southern food at its best: salty and smoky ham offsetting the slightly spicy remoulade and peppery greens, all complimenting the tangy tomatoes. The beautiful presentation of the dish also served a practical purpose: by serving them linearly instead of stacked or in a basket, the tomatoes stayed crispy, and didn’t end up a soggy mess. Though it’s a bit smaller than the deviled eggs, this is still a great starter to share for a table of two to four people – bold flavors dominate here. Chef Art Smith is known for his fried chicken, so I felt like my first trip here had to include “Art’s Fabulous Fried Chicken” ($26), three huge pieces of white and dark meat fried in an herb-and-spice coating, served atop a drizzle of hot sauce with bread and butter pickles, a drop biscuit, and mashed potatoes. You may balk at the price, but the 24-hour buttermilk brine on the chicken really makes a difference – the chicken is incredibly juicy and savory (I wouldn’t have called it salty at all, but if you’re not used to brined fried chicken, you may be surprised by the flavor). The buttery cheddar and chive biscuit is perfect for sopping up the peppery (but not overwhelmingly spicy) house-made hot sauce. The mashed potatoes were creamy, topped with bacon-heavy traditional white gravy. This dish is definitely worth the hype (and price, though if that scares you, go for the sandwich instead – a smaller portion of the same great fried chicken for $16). 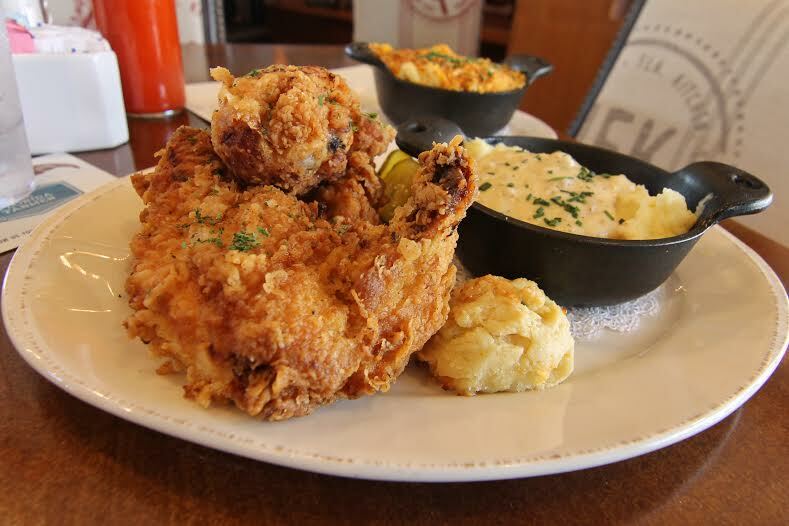 The fried chicken dish was easily shareable between two people, in my opinion – if you are looking at also trying an appetizer, side, or dessert in addition to your meal, that’s definitely the way to go. 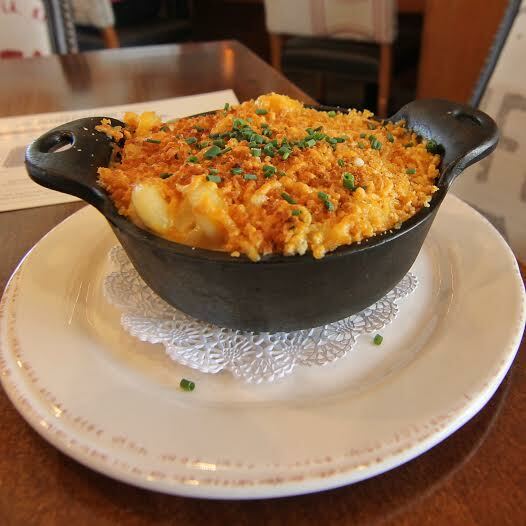 I suppose after a long day touring in the parks, you could finish this dish off by yourself, but then you wouldn’t have room to try some of the awesome sides here, including Momma’s Mac and Cheese ($7). A crunchy breadcrumb topping hides cavatappi noodles soaking up an indulgent cheddar-dominant cheese sauce. There’s no real surprise here in flavor or execution – it’s classic macaroni and cheese done so well that your table will likely fight over the last bite. 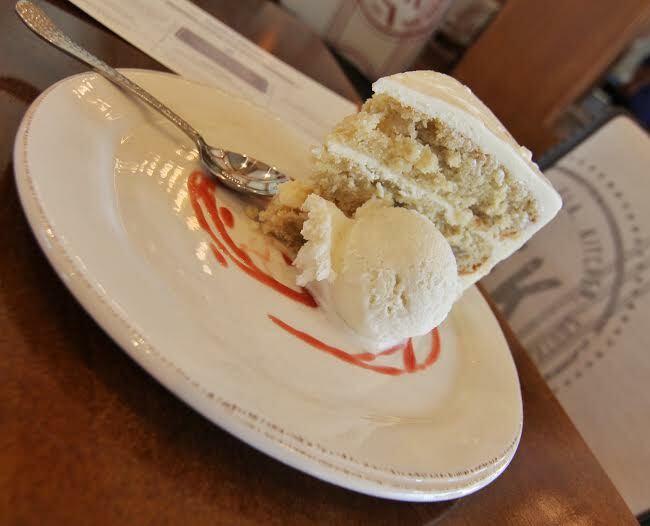 To finish out my meal, I had to give the chef’s hummingbird cake ($10) a try – he’s also known for this recipe, another Southern classic (though its origins actually lie in Jamaica). Banana and crushed pineapple bring sweet and tart flavors to the moist spice cake, with rich, tangy, and dense cream cheese frosting separating each layer and on top. A healthy scoop of vanilla bean ice cream takes the dish to another level of sweetness and decadence. This dish, like the fried chicken, is easily shareable – three or four people could probably tackle this slice with no issue, but two might struggle to finish it. All in all, everything I sampled at Homecomin’ Kitchen hit the spot in terms of Southern comfort classics. All too often, restaurants fiddle with the tried-and-true recipes we’ve all come to love in order to elevate them to “upscale dining” status. Homecomin’ Kitchen does the Southern food tradition justice with excellent flavors and execution without making the food unapproachable – the restaurant doesn’t feel stuffy, the service is fantastic (so speedy, everyone very knowledgeable and friendly), and the prices are such that families can sit down and enjoy a nice meal here together. It may not be the glitziest of the new Disney Springs restaurants, but my meal, even on opening day, indicates it’s certainly one of the best additions to the Disney dining landscape in recent memory. Discount Update: We’ve received word that Homecomin’ Kitchen actually does take discounts already – great news! 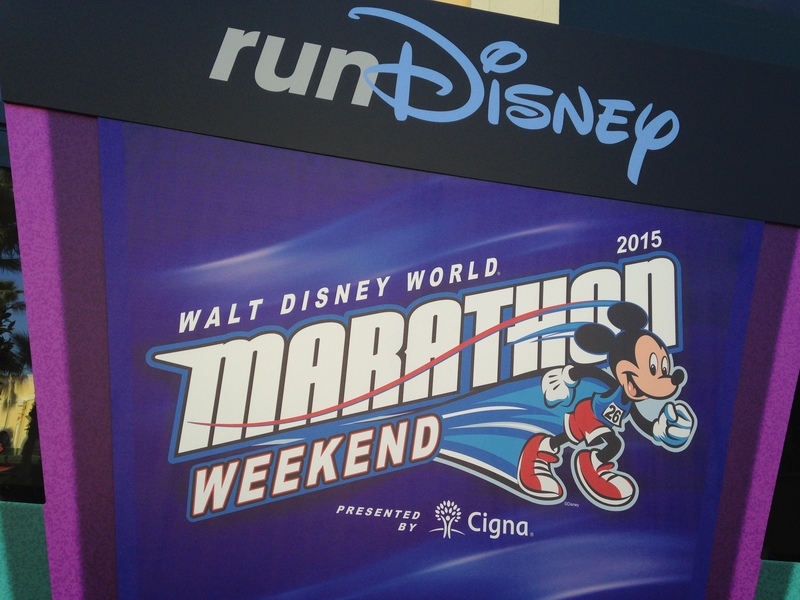 The standard 10% Annual Passholder discount is available, as well as Tables in Wonderland! Even more reason to drop in for a meal sometime soon. Great review! My mouth is watering! I am a local and an AP holder. I am so excited!!! I called disney dining at 7 am, this morning (FRIDAY THE 15th) they are not accepting reservations for August dates until 7/21/16. SUPER bummed!! !